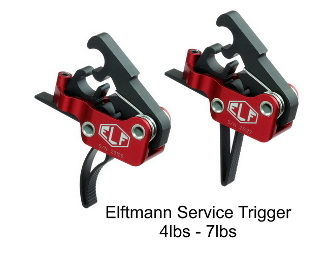 The ELF Drop-In service Trigger has been built for law enforcement and military duty. The only AR-15 trigger using aircraft needle bearings, making for an incredibly smooth and fast trigger pull. The heavy hammer combined with our exclusive .043 double double wound polished piano wire hammer spring ensure full ignition of any ammo including .308 and 7.62×39. Pull weight from 4lbs to 7lbs is so easy to adjust it can be done in seconds without removing the trigger from your lower receiver. A second-to-none AR-15 dropin trigger system that is strong and light, made of wire EDM machined, hardened A2 tool steel and lightweight aircraft-grade aluminum. Installation can be done in minutes using your AR’s original hammer and trigger pins. The Service trigger may be ordered with a curved or straight shoe. The amazingly short takeup, glass-rod crisp break and next to zero over-travel can be compared to the finest custom 1911 triggers. Adjustability puts you in charge based on your preference. If you are looking for the finest adjustable trigger for your service AR-15 platform, this is the trigger system for you.